Help prevent exercise induced myopathies. 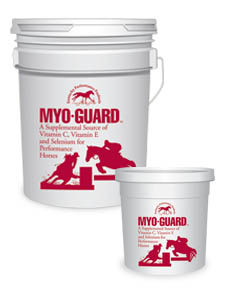 Myo-guard is a supplemental source of vitamins and minerals specially formulated for performance horses which experience exercise-induced myopathies, such as stiffness, soreness and tying-up. Myo-Guard contains vitamins E and C, two powerful antioxidants which protect cell membranes from damage caused by scavenging free radicals. In addition, selenium, a component of glutathione peroxidase, is included in Myo-Guard and is widely acclaimed for its antioxidant activity. Magnesium, a mineral necessary for proper muscle and nerve function is also supplied in Myo-guard.